A squadron in air force, army aviation, or naval aviation is a unit comprising a number of military aircraft and their aircrews, usually of the same type, typically with 12 to 24 aircraft, sometimes divided into three or four flights, depending on aircraft type and air force. Land based squadrons equipped with heavier type aircraft such as long-range bombers, cargo aircraft, or air refueling tankers have around 12 aircraft as a typical authorization, while most land-based fighter equipped units have an authorized number of 18 to 24 aircraft. USAF squadrons may be flying units composed of pilots and flight crews, with designations such as fighter squadron, bomb squadron, or airlift squadron. 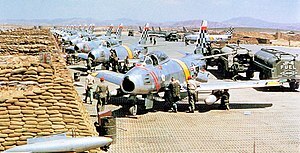 Fighter squadrons may support between 18 and 24 aircraft, while larger aircraft flying squadrons (e.g., bomber, cargo, reconnaissance) may support fewer aircraft. However, non-flying units also exist at the squadron level, such as missile squadrons, aircraft maintenance squadrons, intelligence squadrons, aerospace medicine squadrons, security forces squadrons, civil engineering squadrons and force support squadrons, as well as numerous other examples. During the infant years of combat aviation in World War I and specifically with the trench stalemate at the front military aircraft partially took over the reconnaissance role from the cavalry. With that in mind the British Royal Flying Corps adopted the squadron nomenclature (Staffel in the Imperial German Army, the Austro-Hungarian armed forces and the Swiss Army used the term company). After the fusion of the Royal Flying Corps and the Royal Naval Air Service into an independent Royal Air Force, the new armed forces branch introduced its own system of ranks, with the commanders of squadrons becoming Squadron Leaders. The rapid sophistication in technology and combat tactics has led to increased requirements and qualifications of the officers in command positions and the commanders of RAF flying squadrons were upgraded from Squadron Leaders to Wing Commanders. Today RAF flying squadrons are battalion-eqivalents, while combat and combat service support ground squadrons such as communications or administrative squadrons are company-equivalents. This distinction is also observed in the modern German Air Force, where a flying Staffel is a battalion-equivalent, while a ground based support Staffel is a company-equivalent. One such example are the air base defence units, which are squadrons (German, plural: Staffeln) formed into battalions. The ground based missile air defence units are also company- (in this case battery-)equivalent squadrons (Staffeln). The French Air Force equivalent of an aviation squadron is the Escadron (divided into flights called Escadrilles). (The Spanish Air Force and some air forces of other Spanish-speaking countries follow that tradition (with a squadron called Escuadron and a flight called Escuadrilla), so does the Brazilian Air Force with Esquadrão and Esquadrilha respectively). The Royal Canadian Air Force and the Belgian Air Component on the other hand use Escadrille as the equivalent of a squadron. The Italian Air Force uses Gruppo (group) to denominate its squadrons (same as the Chilean Air Force (Grupo de aviación)). The Portuguese Air Force (Esquadra) and the Polish Air Force (Eskadra taktyczna, Polish for tactical squadron) use the term squadron with its etimology originating from the naval and not the army meaning. The Czech Air Force and the Slovak Air Force use the generic term Letka as squadron equivalent. The Turkish Air Force (Filo) and the Hellenic Air Force (μοιρα αεροπορικής [mira aeroporikis] - aviation squadron) use the squadron denomination originating from the army term. The Royal Norwegian Air Force use the Skvadron term also originating from the army term. So does the Hungarian Air Force with repülőszázad (Hungarian for aircraft squadron or flying squadron, the cavalry company-equivalent term is század). Many Eastern European countries use the term squadron originating from the french word Escadrille: Russian Air Force - Эскадрилья [Eskadril'ya], Ukrainian Air Force - Ескадрилья [Eskadril'ya], Belarusian Air Force - Эскадрыльля [Eskadryil'ya], Romanian Air Force - Escadrila, Bulgarian Air Force - Ескадрила [Eskadrila], Serbian Air Force - Ескадрила [Eskadrila], Croatian Air Force - Eskadrila. The Royal Danish Air Force use the Eskadrile, also originating from the French Escadrille. The Swedish Air Force adopted naval-like traditions in its formative years and for that historical reason calls its squadrons divisions (plural: divisioner). They are grouped into air flotillas (plural: Flygflottiljer). During the Cold War the Swedish Army, Navy and Air Force each had their own integral helicopter arms. After the end of it in line with the mid-90s force reduction and reforms they were fused into a Helicopter Wing (Helikopterflottiljen) as a service, independent from the three main armed forces branches. The Helicopter Wing adopted the term skvadron from the former Swedish Army Aviation for its units, which is squadron in its army company-equivalent meaning. In the early 2000s the Swedish Air Force absorbed the Helicopter Wing as its fourth combat air wing. Unlike the US Air Force, where the name of the base and the units stationed at that base are not related to each other, the name of the wing (flotilla) is in general considered synonymous with the air base where the unit is stationed. For example, the air base where the F10 wing is stationed (in Ängelholm) is commonly referred to as F10 even though it is the name of the tactical unit. In general, this only applies as long as a wing is stationed at the base. Case in point is Uppsala-Ärna air base, an active military airport but since the tactical unit located there has been disbanded it is no longer referred to as F16. These naming conventions have been inherited from the navy where Swedish military aviation has its roots.